Instructor User Guide ResourcesHow do I make a link to a Resources folder appear in the Tool Menu? Instructors can create a link to a Resource folder and have that link appear as a button in the Tool Menu. 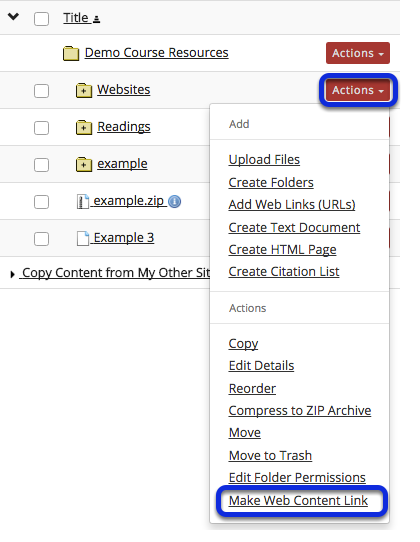 Click Actions, then Make Web Content Link. To create a link to a Resources folder, to the right of the folder, from the Actions drop-down menu, select Make Web Content Link. This displays the Make Web Content Link page. Enter a name, then Add. Enter a name for the page link, then click Add. View folder link in Tool Menu. This creates a link in the Tool Menu. Clicking the button displays the folder contents. Note: Any contextual descriptions that have been added to the folder or files are displayed on the page. Prev: How do I obtain the URL for a file or folder in Resources? Next: How do I create a group folder in Resources?